Two days ago, 241 players took their shot at poker glory here in Event #36: $1,500 No-Limit 2-7 Draw Lowball. Just six of those players returned to action today, competing for the $89,483 first-place prize and a 2014 WSOP gold bracelet. After 77 hands of play, five players were sent to the rail, and only Steven Wolansky was left when the dust settled. Wolansky just missed out on a bracelet last year when he finished runner-up in the 2013 WSOP Event #8: $2,500 Eight-Game Mix. But today he was able to make up for it by winning his first piece of gold. It wasn't easy, though, despite him starting with the chip lead. Wolansky actually got off to a bad start and was at risk on Hand #4. Fortunately, he was able to double through Samuel Touil, who fell to Joseph Cheong two hands later. On Hand #19, Cheong sent Orjan Skommo to the rail in fifth place, and 22 hands later, Christopher Mecklin followed him out the door in fourth, courtesy of Cheong as well. At that point, there was a short break. In the first hand back, German footballer Max Kruse fell. The 26-year-old striker and second-leading scorer for Borussia Mönchengladbach in the German Football League was expected to serve as a reserve for Germany in its attempt at a fourth World Cup title in Brazil, but he was surprisingly left off the roster last month. That afforded him the opportunity to play at the 2014 WSOP, and he made the most of it by playing his first 2-7 draw lowball event after learning the game via a 30-minute crash course from a friend, George Danzer, while watching Germany play against Portugal last week. Kruse's demise came on Hand #42 when he moved all in from the small blind and Cheong made a quick call from the big. Kruse drew one and Cheong stood pat with . Kruse showed that he was drawing very live with , but he squeezed out his last card to see paint. It was a , which meant the German striker had to settle for third place and $36,494 in prize money. 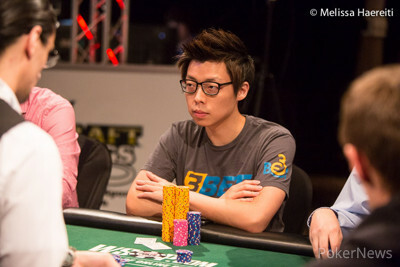 Cheong was responsible for all four eliminations leading up to heads-up play, which he began with a slight chip lead. The match started off slowly, but eventually, he and Wolansky began to play for bigger pots. That was the turning point, and everything started going Wolansky's way from that point on. In fact, he won 11 hands in a row that culminated in the elimination of Cheong. Congratulations to Steven Wolansky on winning Event #36: $1,500 No-Limit 2-7 Draw Lowball for $89,483 and his first WSOP gold bracelet. Hand #77: Joseph Cheong raised to 24,000 and then called off for 215,000 total when Steven Wolansky moved all in from the big blind. Wolansky drew one and Cheong stood pat with . Wolansky showed that he was drawing to . Wolansky squeezed out his card. "It's four across," he said. "Spade." He then showed the for a winning low. Cheong fell just short of his first bracelet and will have to settle for a $55,309 consolation prize. Hand #71: Joseph Cheong raised to 24,000 and then folded when Steven Wolansky three-bet to 80,000. Hand #72: Wolansky opened for 20,000, Cheong called, and then both players drew two. Cheong checked and then folded when Wolansky bet 25,000. Hand #73: Wolansky received a walk. Hand #74: Wolansky raised to 20,000 and won the pot. Hand #75: Cheong raised to 24,000 and Wolansky called. Both players drew one and checked. Cheong showed a king-low, but it was no good, as Wolansky had a jack-low. Hand #76: Wolansky raised to 20,000 and won the pot. 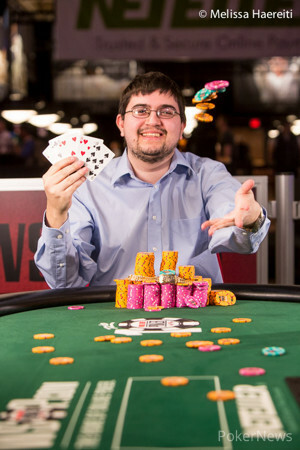 Hand #68: Steven Wolansky raised to 20,000 and won the pot. Hand #69: Joseph Cheong raised to 24,000 and folded when Wolansky three-bet to 80,000. 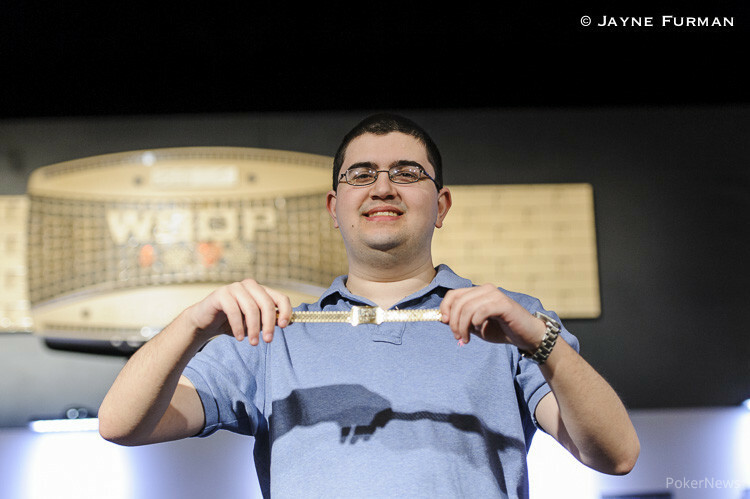 Hand #70: Wolansky raised to 20,000 and was met by a three-bet to 50,000 from Cheong. Wolansky responded by moving all in. Cheong folded. Hand #61: Steven Wolansky received a walk. Hand #62: Wolansky opened for 20,000 and Joseph Cheong called. Cheong drew two, as did Wolansky. Cheong check-called a bet of 20,000. Wolansky showed a -low and Cheong mucked. Hand #63: Cheong raised to 20,000, Wolansky called, and they drew two and one, respectively. Wolansky checked and then called when Cheong bet 20,000. Cheong showed a queen-low, but it was no good as Wolansky had made . Hand #64: Wolansky raised to 20,000 and won the pot. Hand #65: Cheong raised to 25,000 and won the pot. Hand #66: Wolansky raised to 20,000 and then folded when Cheong three-be to 58,000. Hand #67: Cheong raised to 25,000 and then called when Wolansky three-bet to 80,000. Wolansky stood pat, Cheong drew one, and both players checked. Wolansky tabled and Cheong mucked. Hand #58: Steven Wolansky raised to 20,000 and Joseph Cheong folded. Hand #59: Cheong raised to 20,000 and Wolansky folded. Hand #60: Wolansky opened for 20,000, Cheong called, and then both players drew two. Cheong led out for 30,000, and Wolansky called only to muck when his opponent tabled . Hand #52: Steven Wolansky raised to 20,000 and Joseph Cheong called. Both players drew one, which they followed up by checking. Cheong had made a pair of fives, but it was good, as Wolansky indicated he had made a bigger pair. Hand #53: Cheong opened for 20,000, Wolansky called, and then both players drew one, which they once again followed up by checking. Wolansky had paired sevens, and Cheong won the pot with a -low. Hand #54: Cheong received a walk. Hand #55: Wolansky received a walk. Hand #56: Wolansky raised to 20,000 and won the pot. Hand #57: Wolansky received a walk. Hand #43: Joseph Cheong raised to 20,000 on the button and Steven Wolansky folded. Hand #44: Wolansky raised to 20,000 on the button, Cheong called, and then they drew two and one, respectively. Cheong led out for 15,000 and Wolansky called. "Pair of jacks," Cheong said. Wolansky then rolled over to win the pot. Hand #45: Cheong raised to 20,000 on the button and Wolansky folded. Hand #46: Wolansky opened for 20,000, Cheong called, and then it was off to the draw. Cheong took one, Wolansky two, and then both players checked. Cheong showed a pair of sevens, which was no good against Wolansky's . Hand #47: Cheong raised to 20,000 on the button, Wolansky called, and the both players drew one. Action went check-check and Cheong showed a pair of eights. It was no good as Wolansky held a king-low. Hand #48: Cheong received a walk. Hand #49: Wolansky received a walk. Hand #50: Wolansky raised to 20,000, Cheong called, and both players drew one. Cheong led out for 30,000 and Wolansky called. Cheong showed a -low, but it was no good as Wolansky held . Hand #51: Wolansky received a walk.